I am constantly awed by some people’s recall when it comes to football. I expect you know at least one person like this: someone who can remember results and attendances going back decades, and greets refs as they trot on with the phrase “oh, it’s him again”, not because of recent controversy, but because they slipped on a divot whilst handling our home game against Chippenham five years ago, or something. Also to be admired are those who know exactly which opposition players they’ve seen, been impressed by and would love us to sign. Give me a line up of blokes who enjoy The Sun, Adam Sandler movies and the music of Jay-Z and I wouldn’t be able to pick the footballer out of it. Having a line up of chaps who fit the Shoot!-questionnaire-answers stereotype (the 80’s version of this article would reference Only Fools and Horses and Luther Vandross) would flummox me from the get-go but I know some who would go “step forward number 5, you played against us at left-back for Grays” straight away and be able to list all their former clubs, their place of birth, even their pass-completion ratios. It wouldn’t be so frustrating if my memory was lax on all matters. For instance, I realised the other day that I remember more than I’d like about things Paul Daniels has been responsible for. Frankly, that’s three things too many. However it’s not as though I always register a complete blank. Occasionally at a game I’ll look at a player or manager and have the dimmest of eco-friendly lightbulbs haze slowly into life over my head. Usually I’ll squint at them for a while before eventually coming to the conclusion that I’ve seen them before, somewhere. Can’t beat that for pinpoint remembrance. And so it was, here at Uxbridge, as I stood behind the home-side’s dug-out looking at their assistant manager like I was trying to read small print written on the sun. It might have been easier if I’d just looked at the programme and read the name ‘Scott Tarr’ first as that would have confirmed his familiarity. Even so, I still had to check afterwards to recall exactly where our paths had crossed. Two and a half years ago at Maidenhead, as it happens. He was a heavy-set keeper, and I was part of a crowd ready to trade gags. As that report suggests, he was in a cheerful mood that day, taking our banter regarding his body erring towards the portly in good part and generally having a pleasant time with us. Probably helped that his team gave us a sound beating that day too, but it always adds to the occasion, win or lose, when a keeper is willing to have a bit of fun. Perhaps management adds more weight to the shoulders (moving off the pitch has not exactly helped Scott shift it from other areas for a start) but he certainly seems a lot less personable in a technical, rather than a six-yard, area. Pretty much every sentence ended with “you nugget” or a word that rhymes with shunt, although I did find the phrase “get your head up and get at these people” as remarkably quaint, particularly being amongst more abrasive surroundings. Uxbridge’s head honcho Tony Choules was similarly keen to get into some swearing, even if the sentences didn’t always quite work in the manner he would have liked; “get your body in there and stick it f***in’ up, I’m 50 f***in’ stone and I can still stick it up” the finest example. 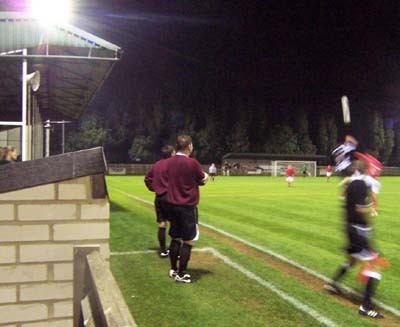 The distractions were necessary to enliven a dull first half where nothing much happened, except the start of some festering indignation in the Uxbridge dug-out towards the referee’s decision-making. A 0-0 scoreline was in keeping with the form both sides had shown thus far in the season, neither able to claim a league win, Uxbridge being second to bottom in the Southern League South & West Division, with Heybridge rooted to the basement, albeit a level higher, in the Isthmian Premier. The second half began in much the same manner before a twenty minute period when it all went off. First Heybridge Swifts, largely against the run of play, scored a fortunate opener when Craig Hudgel’s cross deflected in off defender Ryan Wharton’s arse. However Uxbridge fought straight back, scoring an equaliser within two minutes; the full-bellied Wayne Carter put his foot behind a cross that was headed down by Lee Tunnell and, whilst prostrate, Kevin Warner poked home from close-range after a melee. Not long after, Frazer Toms’ poorly judged tackle got some heat going, with yellow cards being shown to three players. 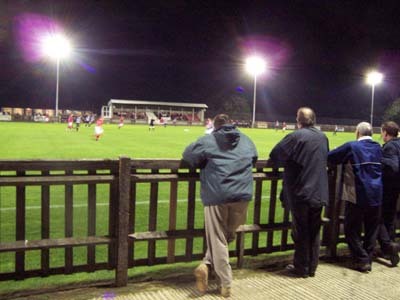 With the game’s intensity now jogged up several notches, Heybridge took the lead once more on 71 minutes through another own goal. Keeper Paul McCarthy saved an incoming shot but Dave Lawrence following up could do nothing but put the ball in the net despite staring into a chasm. Two minutes later Heybridge sealed the game with a third, Hudgel got hold of a desperately poor pass out of defence by Ian Dickens and fired beneath McCarthy to finally get the away support singing; four fellas giving it some “when the Swifts go marching in” to break the quiet for the first time since kick-off. That said, there was still plenty of noise coming from the Uxbridge bench, at least until the young linesman finally got fed up with the box-headed Choules drilling some scarey-eyed threats like “don’t you tell me what to do” into the back of his passing skull. The ref, after a quick chat, sent Choules to the stands, but not before he could get involved in an argument with an ageing groundhopper in a CAMRA windcheater who had said “about time too ref” upon the dismissal. Prior to this, the man had been responding to every comment on the officials from the bench by loudly murmuring “if only the players were as good as the refs”, “they do a good job” and “well, football managers aren’t as intelligent as chaps like us” to those around him. 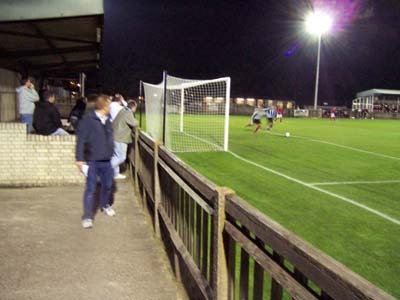 With his attention stolen by an old man’s ‘button’ it is perhaps no surprise that Uxbridge offered little beyond this point and so Heybridge could relatively stroll their way to the 90th minute. The Swifts went on to face Wroxham of the Eastern Counties League in the next round bringing to an end a line of ‘bridges’ -Redbridge succumbing to Uxbridge and then they to Heybridge. Wroxham has a new semi-circular road-bridge apparently but it might be stretching it a bit to shoe-horn that into this theme, it already being quite dull.